An exhibition of work by Chris Henderson. Monday 7th December to Saturday 30th January. Long before being a professional photographer had ever crossed my mind, I saw cameras not as a means of simply recording an image but as a way of creating something new and unique. Photography was not about capturing things as they were. I deliberately sought out cameras which would make photographs with character, lenses which would leave behind a distinct personality embedded in each image they created. I wanted my cameras to intervene, to alter and manipulate what was in front of the lens and to make something unpredictable and exciting out of the all too familiar surroundings of Aberdeen. The work in this exhibition was shot over a period of several years, mostly on film. Many of these images I would describe as experiments or happy accidents, the processes and equipment used having as much of an influence on the final image as I did as a photographer. I’ve called this show ‘the end’ mainly because a lot of the facilities, cameras and film I used to create these photographs have since become harder to find, prohibitively expensive, or even extinct, possibly forever. The dominance of digital photography may not literally be ‘the end’ of these techniques, but they have become far less accessible to new photographers than they were when I shot these photographs. Every photo in this exhibition has had some sort of digital reworking, but none of them would exist as they are without the unpredictable quirks and imperfections of the analog processes used to create them. Chris Henderson graduated from Gray’s School of Art in 2006. He reluctantly ‘went digital’ in 2007 and now works as a freelance photographer documenting weddings, events and the Aberdeen nightlife scene. 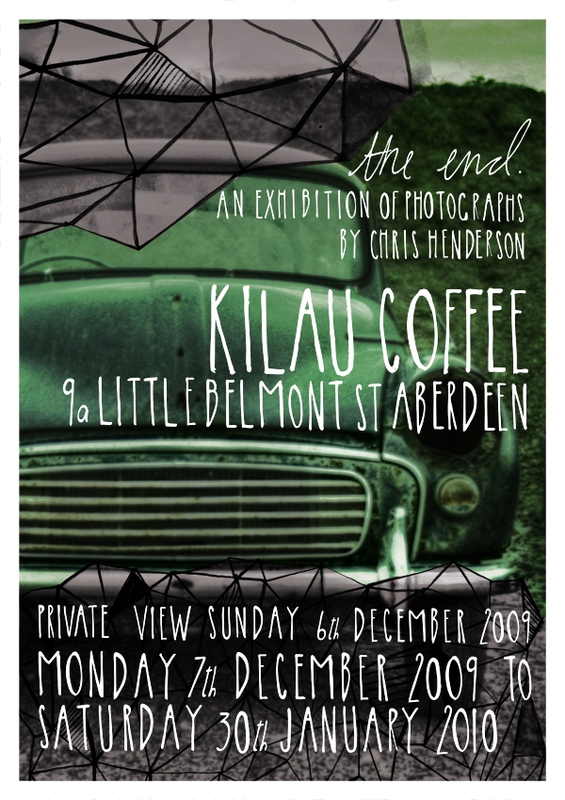 Posted on November 28, 2009 by kilaucoffee Tagged exhibitionrae duncan	CommentsNo Comments on Illustrator in residence! 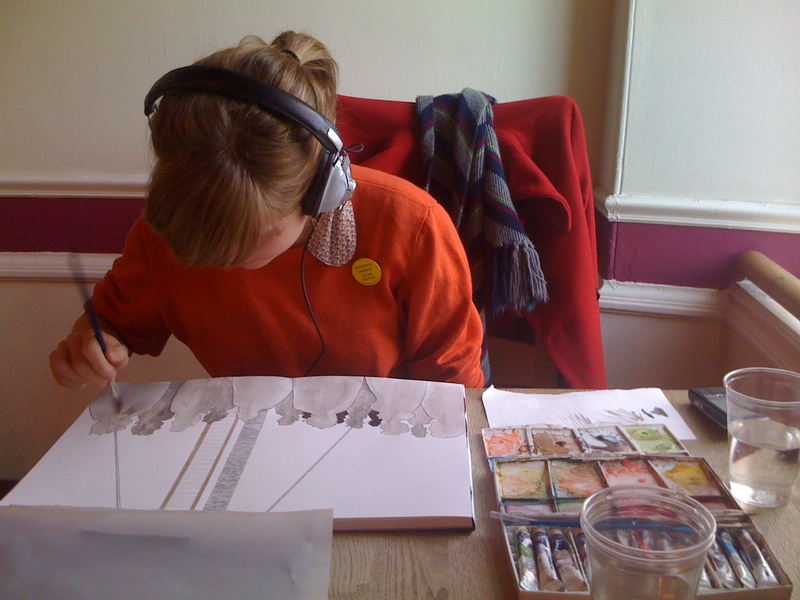 Up coming exhibitor and illustrator in residence, Rae Duncan, hard at work in kilau! 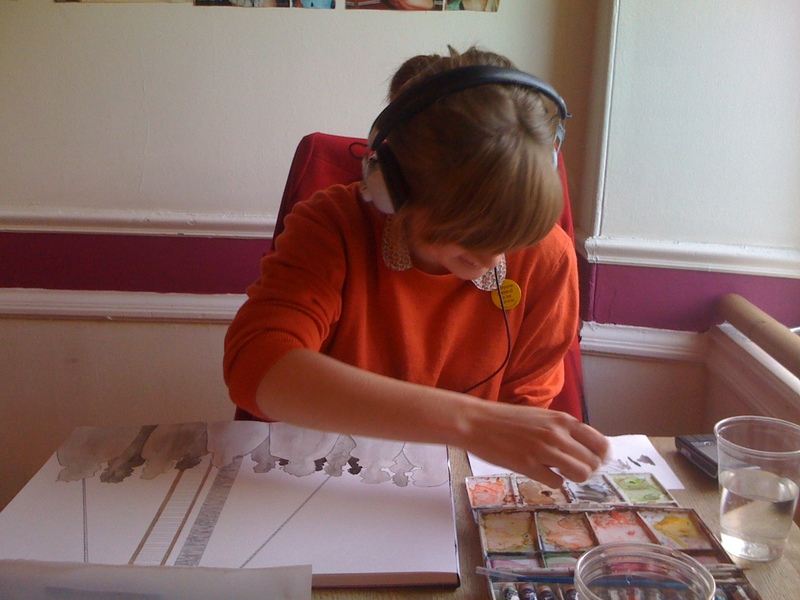 You can see more of Rae’s work on her blog and her flickr. Rae will be exhibiting with us next September! 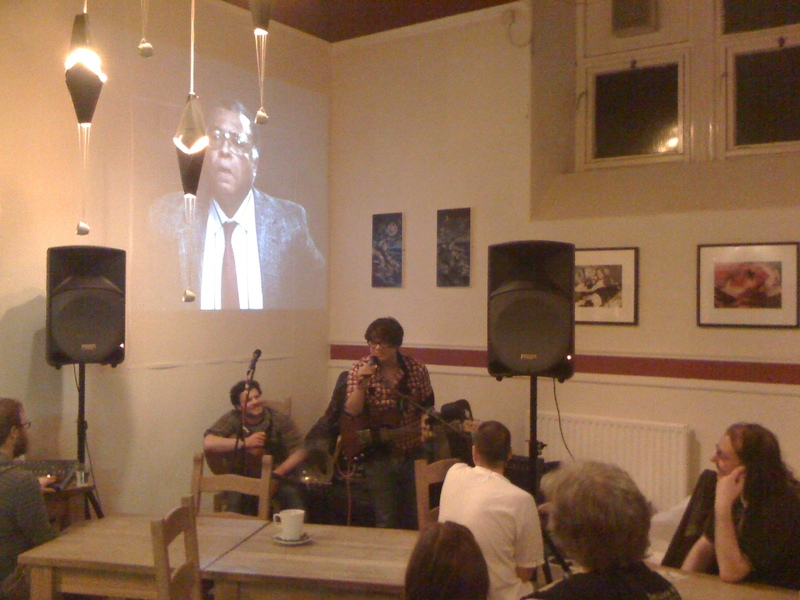 The debut of Les Pelicans last Sunday was a roaring success. I grabbed a couple of grainy iPhone photos of them, here they are for your delight and delectation. Regrettably the ones I took of Matricarians were just too blurry. It’s a busy weekend for kilau! 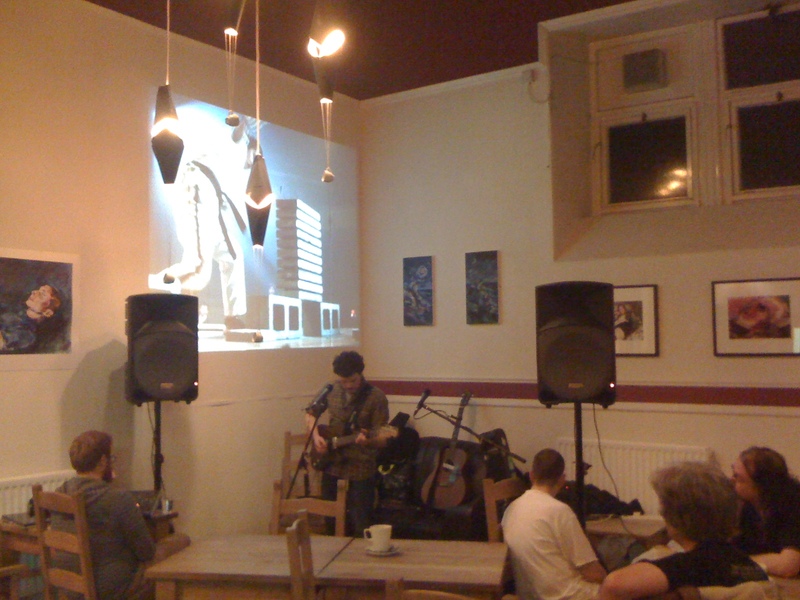 As well as the Mindscape exhibition we also have great music lined up for Sunday night! Maticarians – Improvised musical pieces inspired by the folk songs of North East Scotland. By their own description they sound like “a river of rowies cascading onto a corrugated iron roof.” Not to be missed! Les Pelicans – I am very excited to announce the debut of Les Pelicans featuring Teej Kapowski and James D. Rousseau. CHECK THEM OUT! 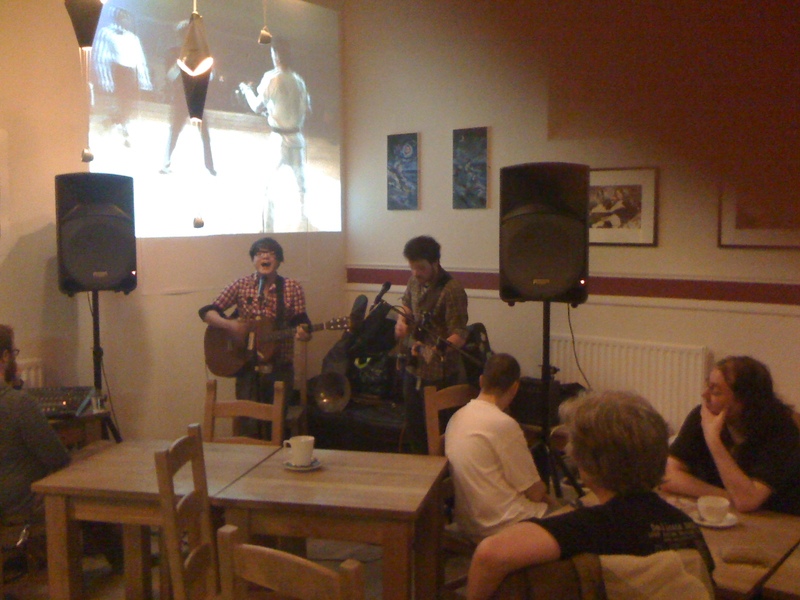 Music from 8.30pm and entry is free! I have had the kibosh put on my music list I’m sorry to say. I have managed to start later in the day, but this means my iPod isn’t used for music! However, if you’re interested, I have been mostly listening to Found, Nick Cave and Florence and the Machine!